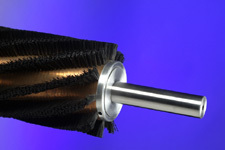 Textile Brushes | Industrial Brush Company, Inc. The Textile industry has depended on Industrial Brush for the manufacturing, printing, and finishing of textile products. We pride ourselves in our knowledge of applications. In an industry that changes with the desires of taste in clothing, Industrial Brush has provided expertise and a complete testing facility to test brushing applications and theories. of fabric has come a long way since the original hand held screened wooden tray. However, one thing has not changed, that flocking of fabric requires rotary brushes to dispense (or meter) flock through screens, cloth-room brushes to remove excess flock, and finishing brushes to give the finished fabric loft and a feel of direction. Our newest applications for finishing flocked goods involve our new conductive nylon brushes that help to remove the static electric charge that has been a problem for years. or card cleaning brushes have been a revolutionary replacement for the typical fillet wire brush. Our "Fineset" brush provides superior cleaning, longer life, and less down time. It has a bristle pattern that incorporates individual strands rather than clumps or in-house glued spiral wire wraps. It is practically self-cleaning, can be installed in minutes and is far superior to the old wood core rolls that never run true. Unlike wire fillet, the nylon bristle will not wear unevenly like steel wire and the Doffer roll remains unabraded. continue to be the most popular brush used in textile manufacturing. The Industrial Brush lint removal brush has been a winner for years. 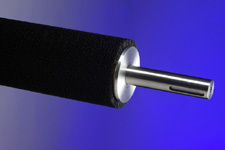 Lint removal brushes raise nap and remove lint and thread from all types of fabric. 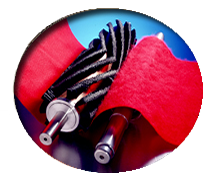 Lint removal brushes can be made to aggressively remove lint from heavy weight greigh goods or from a lightly woven fabric. We have the experience to make good recommendations and we also can test your fabric on our in-house test machine. is a fabric that demands brushing. From the beginning of manufacturing to dying and finishing, corduroy demands brushing in order to give it appealing characteristics. It is cross-brushed and directionally brushed constantly. 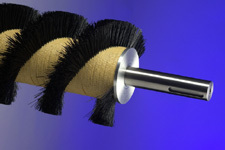 Industrial Brush offers manufacturers our test machine and years of experience to help determine if cylinder brushes are a fit for your corduroy finishing. is an old type of textile printing that has been replaced by the screen printers. However, there are still some quality shops that continue to operate these machines because they know the value and quality of the finished product. 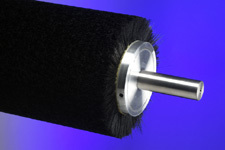 Industrial Brush continues to offer the furnisher brush in both "Tufted" and "Fineset" for applying ink to gravure rolls. The brush continues to be the best applicator because of its ability to keep the engraving from building up with dried colors (color coagulation).